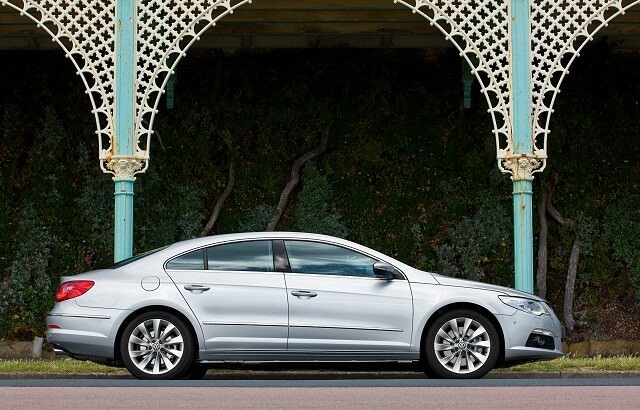 The Passat CC is a clever re-skin of a capable all-rounder that brings some real style to the mainstream saloon class. You’ll pay a bit more for it, it’s less economical and practical than its regular Passat relatives, but it’s arguably worth that for the additional visual appeal it brings. A good used buy. Volkswagen’s rather shameless pastiche of the Mercedes-Benz CLS adds some real glamour to VW showrooms and sharp looks on the road. The CC here stands for ‘Comfort Coupe’ despite it being a four-door saloon - albeit a sleeker, lower one than the conventional Passat it’s based on. Introduced in 2008 it’s still a relatively rare, if arresting sight, it’s a bit more expensive than its plainer Passat relative, but those looks are worth the extra outlay. The glamorous relation to the excellent - if somewhat forgettable - Volkswagen Passat, the Passat CC is somewhat confusingly described by Volkswagen as a four-door coupé. It’s a saloon, though one that’s lower, wider and more arrestingly styled than its plain-Jane relative. That wider stance makes the Passat CC feel a bit more engaging to drive, but it’s not too far removed from its Passat relative in reality. Unsurprisingly the CC shares much the same model line-up as its big-selling relative; though the CC’s more upmarket status does see it do without some of the smaller engine choices. It gains at the other end of the scale, with a four-wheel drive 3.6-litre GT version heading the range (pretty much non-existent in Ireland). Much like all its rivals it’s best chosen with one of the 2.0-litre turbodiesel choices - of 140- or 170hp outputs - which offer a fine blend of economy and performance. Manual or dual-clutch ‘DSG’ automatics are available too, though they're more expensive. Two rear seats limit passenger carrying ability (until the 2011 version), but the boot is a decent size and shape for luggage. The interior is as well built and finished as you’d expect from VW, but it’s lacking the visual flair of the car’s exterior. The 2.0-litre TDI CR engine is the best choice in the range; it's offered with either 140- or 170hp. You’ll not feel short-changed with the lower output car, as it's only fractionally slower and more economical with a combined fuel consumption figure of 4.7 litres/100km and CO2 emissions of 125g/km. A standard Passat with the same engine/transmission manages 4.6 litres/100km and CO2 emissions of 119g/km. You’ll want the CC though, as it’s a stunning looking car for only a little more than mainstream money.